Rick Rowland and I unbricked a lovely kiln this morning, our second very nice firing this year. 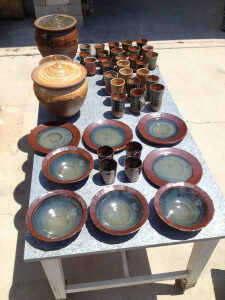 In addition to several of Rick’s vases of various shapes and sizes, the firing brought me, among other things, three Summerhaven jars: one the usual size (about 11″ high), but two of my first attempts at larger versions (one 16″ and another 14″), both produced by combining together two separately thrown cylinders. My take also included my first dinnerware set in about two years. A commission from friends in Tennessee, it consists of four plates, four serving bowls, and four small tumblers. They’re all lined with woos blue, surrounded by tomato red. 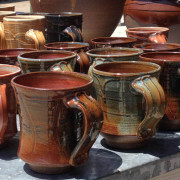 Finally, the firing included about three dozen mugs, including a number of 16-ounce versions of what I call modified double barrel mugs, with a flared base and a fluted top. I’d been throwing these for about a year, but they were consistently bottom heavy. A new throwing technique, involving aggressively trimming a slightly damp, tall cylinder before shaping the finished form, helped me get the mugs down to an acceptable weight. All the mugs, including about a dozen 12-ounce convex forms, were festooned with drippy slip and glazed with woos blue; shino; woos blue covering shino; or white salt. 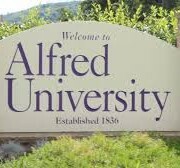 This will be my last firing before heading to Alfred (New York) University for two, two-week clay workshops.